In Ocean City, we take safety very seriously. After all, we want everyone to have a pleasurable, safe and fun vacation. Please take a moment to read this very important information regarding our town ordinances, designed with your well-being in mind. Millions of visitors travel to Ocean City each summer, so it's important that vacationers are mindful of our highway laws. There are bus/bike lanes on both sides of Coastal Highway to support flow of traffic. Please do not park or drive in these lanes unless making a right turn. Be alert for bicyclists when entering or leaving the highway. Municipal buses travel in the far right-hand land on Coastal Highway. They stop and pick-up or discharge passengers only at designated bus stops. When following a bus, please keep this in mind. Motorists must yield right-of-way to pedestrians crossing the street at a crosswalk, at any controlled intersection when obeying the traffic signals, and at any non-signaled intersection. Bicyclists must obey the same traffic laws as motorists and may receive citations for failure to obey these rules of the road. The most common violations committed by bicyclists are riding against the flow of traffic in the bike lane and failing to obey traffic signals. At night, a headlight and rear reflector are required on all bicycles being used in Ocean City. For information on parking lots and rates available, click here. For information on parking of trailers, please click here. 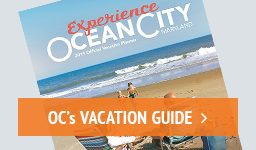 For information regarding Ocean City transportation options and services, click here. It is the responsibility of every Ocean City visitor and resident to be alert and responsible when walking throughout town. Please cross only at marked crosswalks, preferably those with pedestrian signal lights. Maryland law requires pedestrians use the sidewalks where available, rather than walking in the street. Please do not walk or jog in the bus/bike area on Coastal Highway. Hitchhiking is also prohibited in Ocean City. In Ocean City, we take laws related to alcohol consumption very seriously. Drinking alcoholic beverages in public is prohibited. This includes on any street, avenue, alleyway, sidewalk, beach, parking lot and vehicle in any of these areas. Possessing an open container of any alcoholic beverage in public is not allowed. Sleeping in any motor vehicle within the city limits of Ocean City is prohibited. Sleeping on the beach also is not allowed between 10:00 p.m. and 6:00 a.m. Ocean City is proud to be home to one of America's most popular and family-friendly boardwalks. Our 2.9 mile boardwalk stretches from the Inlet in South Ocean City to 27th Street. In addition to our famous boardwalk, our 10 mile stretch of the beach and the beautiful Atlantic Ocean is free and open to the public from 6:00 a.m. to 10:00 p.m. The remaining hours are used to clean the beach for everyone's enjoyment the next day. No private vehicles are permitted on the beach at any time. When swimming in the ocean, it's important to be careful. Ocean surf can be rough and it is best to swim using the buddy system, have someone with you in the water at all times and always swim near a lifeguard. Beach Patrol members are on duty from 10:00 a.m. to 5:30 p.m. daily all summer to ensure your safety. Please obey the Beach Patrol when you are on the beach, they are there to protect you. For more safe swimming tips, visit the Ocean City Beach Patrols Website. Want to catch some waves? Ocean City has some great waves, but surfing is only permitted on two surfing beaches announced daily on local radio stations. For everyone's safety, these two areas are dedicated to surfing only for the day indicated. For more information on surf beaches and beach conditions, call any of the area surf shops. Surf fishing is permitted in Ocean City. However, be sure you are not within 50 yards of swimmers or of anyone on the beach between 9:00 a.m. and 6:00 p.m.
Frisbees, ball throwing and other sports are not allowed on the beach from 9:00 a.m. to 5:30 p.m. daily from May 30th to September 15th, by Town Ordinance. Ocean City now offers horseback riding on the beach during winter, early spring. Permit applications are now available to persons wishing to ride horses on Ocean City's beach. Applications can be obtained from the City Clerk's Office in City Hall at 301 Baltimore Avenue or online at www.oceancitymd.gov. The cost is $20 for a single-day permit and $50 for a seasonal permit. Horseback riding will be allowed on the beach beginning at 27th Street and extending south to the Inlet jetty between the hours of 6:00 a.m. and 5:00 p.m. November 1st to March 30th. Bringing your four-legged friend? It's important to note that animals are only allowed on the beach and boardwalk between October 1st and April 30th. Any handler or owner of a dog must remove any waste deposited on public or private property not owned by the handler or owner in possession of said dog. Also, dogs must be kept on a leash when being walked in and around Ocean City. During peak-season and year-round, a Dog Playground is available at 94th Street and bayside so your pet can let loose and enjoy their time in Ocean City. For more information, contact OC Recreation & Parks at (410) 250-0125 or click here. To ensure safety on this heavily-traveled walkway, certain regulations are in effect. For more information on skateboarding, biking and rollerblading regulations, click here. Remember that many folks are here visiting to relax. Please be respectful of your neighbors both on and off the beach. It is unlawful for any person to make, cause, or continue any loud, unnecessary, unnatural or unusual noise, or any noise which annoys, disturbs, injures or endangers the comfort, repose, health, peace and safety of others at any time, day or night. Ocean City strongly enforces its ordinance that no disruptive noises be made between 12 midnight and 7:00 a.m. in such a manner as to be heard at a distance of 50 feet from the building or structure from which it is located. Maryland Motor Vehicle Law and Ocean City Town Ordinance state that no loud noise from a vehicle may be heard at a distance of 50 feet from the vehicle at any time. For additional amendments to the noise ordinances please see this information.